I very much enjoyed being interviewed yesterday by Lynn Briggs, drivetime presenter at 105 Uckfield FM. We talked about Charles Wells – his inventions, his amazing successes at Monte Carlo, and his many brushes with the law over the years. Lynn played a brief snippet of Charles Coborn performing The Man who Broke the Bank at Monte Carlo, which probably jogged a few memories in and around Uckfield! Monday, 3 August, was a bank holiday — one of the country’s few days off work, a rare day of rest for the majority of people. Britain woke from its weekend slumber — and then went back to sleep again for a bit longer. It was a day for trips to the seaside, to the countryside, to circuses, fairs, and other attractions. In the London area over 50,000 visited the Crystal Palace, while an estimated 80,000 made their way to Hampstead Heath for the fair. That day’s newspapers carried fresh reports of Wells and his incredible gambling feats at Monte Carlo — a good-luck story that resonated perfectly with the happy holiday atmosphere. Mr. Wells, who won within a few days £20,000 at the table here, won a further sum of £6,000 yesterday. Extraordinary luck again favoured him today, for he won no less than £14,000 at trente-et-quarante. The table was surrounded by a large crowd, and intense excitement prevailed, such persistent good fortune having never been witnessed before. Mr. Wells, whose winnings commence to have an effect on the bank, keeps two secretaries to assist him in his transactions. I’ve been invited to appear today on local radio station, Uckfield FM, as a guest of drivetime presenter Lynn Briggs, to talk about The Man who Broke the bank at Monte Carlo. The show is on the air between 4.00 p.m. and 7.00 p.m.
Uckfield FM serves the town of Uckfield, East Sussex, and surrounding district, on 105 FM and online here. 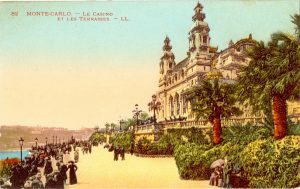 The Casino at Monte Carlo. A view on the southern aspect. Mr. Wells, the Englishman who had so extraordinary a run of luck last week at the gaming tables here, winning over £20,000 at roulette [equivalent to £2 million], continues to be favoured by the same good fortune. 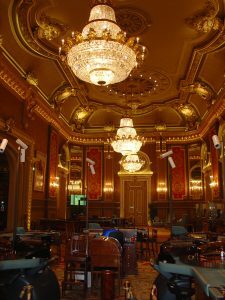 Finding the luck turning against him, he had the prudence to quit the table at which he had been assiduously playing day after day from the opening of the Casino till its close. Before leaving the building, however, he risked a few stakes at another game, trente-et-quarante [a casino game played with cards], and, winning each, continued to play till he had further increased his gains by the sum of 160,000 f, or close upon £6,400 [£640,000 today]. Mr. Wells at trente-et-quarante follows the same system that proved so successful at roulette – the famous ‘coup des trois’ – that is to say, following the luck till he has won thrice in succession, and then withdrawing the accumulated stake. People here and at Nice are talking of nothing but his marvellous success. … or ask at your local bookshop! (Information believed correct at the time of writing).